Hail Of All Sizes Can Harm Your Roof. One thing that we would like to regulate about the weather is how it affects our roofing system and property. 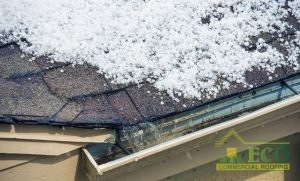 Hail in particular are the most harmful, acquiring a bit of roofing damage for property owners to deal with. Regardless if you have composition shingle, metal, or shakes, hailstones will make your roofing system and property more susceptible to destruction. A good option that can keep your roof and residence safe in the future, is dependable roof hail damage repair. Superior roof hail damage repair will not only repair your roof, but it can also guarantee your roofing system and residence is secure To get the roof hail damage restorations that you and your roofing system needs, you are able to rely on the expert roofers at ECO Commercial Roofing. Our roofing contractors are able to provide client service and roof services that are dependable and effective, guaranteeing each service is treated with immense care and proficiency. To get the best roof hail damage repair in Tyler, TX all you have to do is contact (833) 200-0571 to speak with one of our roofers about making an appointment. We Can Easily Detect Any And All Damages. Hail damage is something many homeowners dread, and yet once the storm moves on, many homeowners decide not to contact a roofing contractor for roof hail damage repair because there is no evident damage. This can cause many problems down the line as hail damage is not always evident at first look. Roof system structures can obscure hail damage for a long time beneath the layers of materials that make them up. The next storms can unveil leaks and and other unexpected issues you were not aware of. Having a roofer inspect your roofing system and complete roof hail damage repair can avert such unexpected issues. When left unrepaired, hail damage can decrease the life of your roofing, damage materials, create leaks and even allow for mold, mildew, and wood rot in your property. 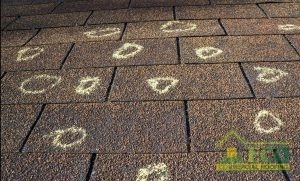 Ward off all of these issues with inspection and roof hail damage repair! At ECO Commercial Roofing, we are proud to provide homeowners with the best roof hail damage repair in Texas, Louisiana, and Mississippi. Call (833) 200-0571 to talk with one of our skilled roofing contractors about your roofing needs!